I present the set-up of a 2-channel system, with simple subwoofer calibration. With measurements shown, so that we can see what is actually going on. 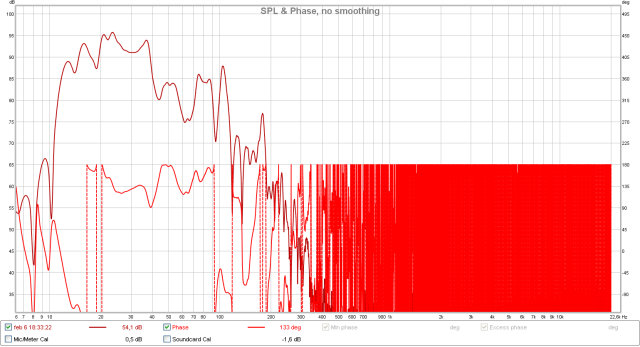 And I will show how to try without measuring, only using a pink noise signal that can be played back from a file. This is a standard 2-channel system with digital or analog source, controlled by an analog preamplifier. 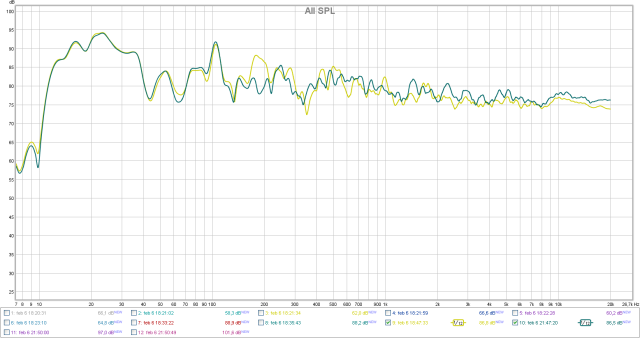 No DSP, no room correction, no bass management. The subwoofers have no digital processing, the only adjustments are level, crossover frequency (low-pass filter) and phase. The main speakers will play full range down to whatever frequencies they can output, there is no low bass cut-off. This configuration is what many enthusiasts actually will have for a 2-channel system. Now I will show that it is possible to integrate subwoofers into such a system with great success, even though there are limitations and compromises will have to be made. The addition of capable subwoofers transforms this system into full-frequency range with reference quality bass. This is a nice, smaller system, with satellite main speakers driven by a class-A amplifier with low output power. Max SPL is rather low, we hope for a nice and pleasant sound with a true three-dimensional presentation and great bass with precision, slam and capacity all the way down to far below hearing range. Placement not too far from the main speakers, but try to get positions with good gain and smooth response. Adjust phase individually on subwoofers to get the best response of subs only. Low crossover, 60Hz, max 80Hz. 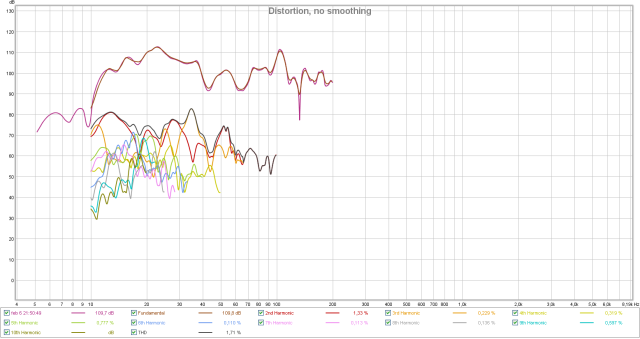 Use RTA (Real-Time Analyzer) to see effects of adjustments in real-time. Adjust crossover and level on subwoofers to get as close to your target response as possible. While having the measurement gear out this is a good time to try alternative positions for the main speakers. The important parts for this exercise are the main speakers, subwoofers and the room. Source and amplifier is not that important for set-up and calibration, as the process and measurements will be the same for any amplifiers without processing for crossover and delay. 3.6m width x 4.5m length. Door opening on right wall, large opening into other room through rear wall, window on left wall. Other room length 4.1m together with this room defines lowest length node at approximately 8.6m. Wood panel on all walls and ceiling, wood floor. Some chairs and a round table, media console for audio equipment. No additional acoustic treatment of significance. Low frequency response of this room is dominated by the total length of both rooms and the door opening acting as the port in a resonator where the room is the cabinet. 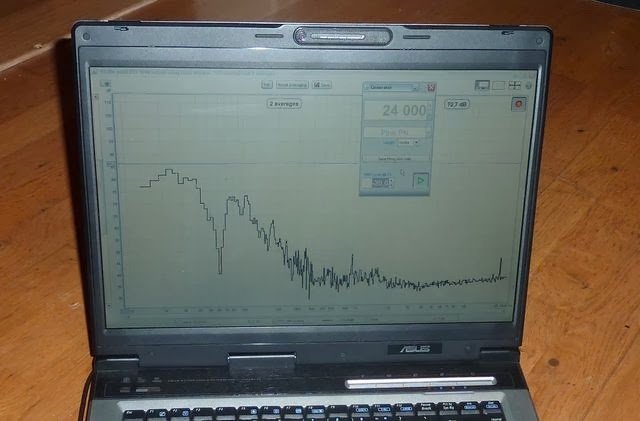 This causes resonances from around 15Hz up to around 25Hz, where room response is strong. Small satellite system with 8" bass driver sealed, 2x 14cm mid, 1" dome HF. 2x small Compact Horn subwoofers with 10" driver (105dB/20Hz/2pi/1m, equals approx 12" ported or 15" sealed of high quality). REW measurement software, calibrated microphone, computer, USB I/O. We want 2 subwoofers to be able to get a reasonably smooth response. That also gives more output (+6dB), so that we can use smaller subwoofers, it is easier to place 2 smaller boxes compared to one giant monster. The subwoofer locations can be determined by measurement, either by measuring at the listening position (LP) while moving subwoofers, or by placing one subwoofer at the LP and then move around with the mic. Use the RTA in REW for this, run Pink PN Noise, then you can see the response in real-time while moving the mic around. The fact that we have no way to adjust for time differences between mains and subwoofers will limit placement options. Ideally the subs should be a little closer to the listening position (LP). 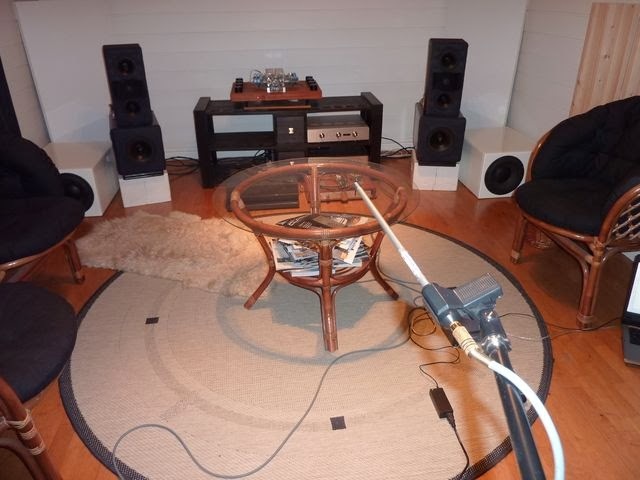 Here we start out with a practical location that also works; in front of the main speakers, towards the corner. Bass is strong, and because the sound radiation is from the front of the subwoofer, it is radiating at some distance away from the corner, which usually gives a smoother response. In a set-up where the best sound quality is the goal, we do not want the main speakers in the corners, so this location is free to use. Placement of one subwoofer towards the rear of the room, behind the listening position, can also be an option. What will work in your room will depend on the acoustic properties of the room, as well as obvious practical considerations. 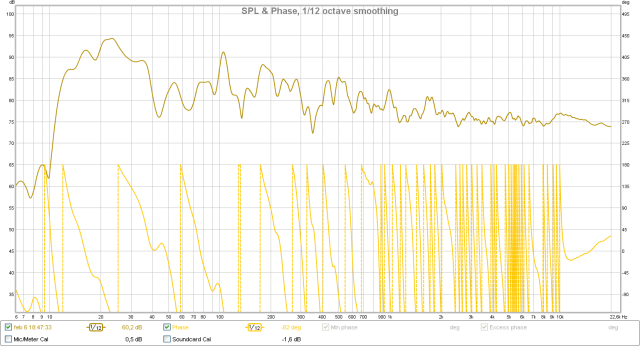 First the phase is adjusted on one of the subs to fill the response dip around 50Hz. For this particular room and sub locations this adjustment makes a large difference, but that may not be the case in a different room. Obviously, the room is not acoustically symmetric for both sub locations. 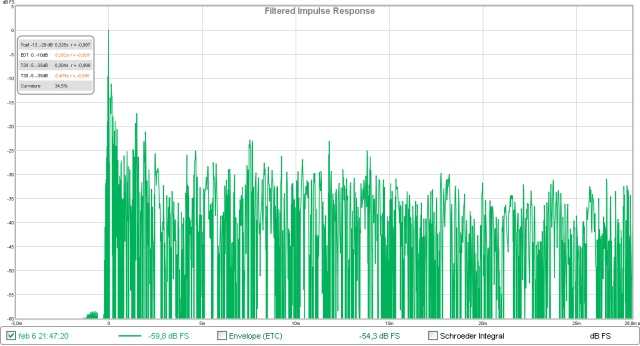 Use RTA, adjust while monitoring the response in real-time. Then the phase on both subs are adjusted so that they fill in with the main speakers. 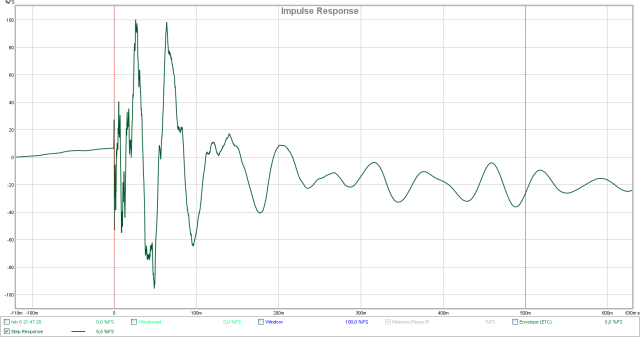 Use RTA, watch how the response changes around the crossover frequency, adjust to max level. Adjust to achieve a reasonable frequency response that extends the natural downwards tilt, and you may prefer some extra level at the lowest frequencies below 40-30Hz. Consider choosing a crossover rather low, below 80Hz or lower, to minimise effects from time alignment issues. Note that it may be necessary to adjust phase after changing the crossover. All this is best to do with the RTA, so that you can see the changes in real-time. Using a pink noise signal and your ears to adjust phase, level and crossover for subs may at least give some improvement compared to no adjustment at all. 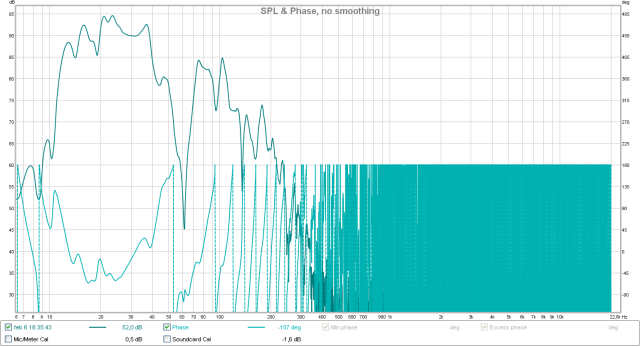 Play a 200Hz bandwidth-limited pink noise signal from file. Adjust phase on one sub for loudest possible signal. Then adjust phase on both subs to get loudest level around the crossover frequency. This is the more difficult part, because is is not easy to know how the noise should sound when the setting is correct. Level and crossover is not easy to adjust using pink noise, because you would have a problem knowing how it should sound when everything is right, unless having a reference readily available to compare with. Headphones may be a solution - listen on headphones, then compare to how it sound on the system and adjust to same sound. It may be better to use some known music with bass, as actual music is more likely to reveal when something is way off, compared to a noise signal that still sound like what it is - noise. Obviously this is something that is not very easy to get right without measurement. The result depends heavily on the chosen program material and the listeners ability. Seems like the tilt is a bit too much down at higher frequencies, and it also sounds rather dark with recessed highs. In the midrange the response could be more flat, this is likely caused by boundary reflections from walls and floor around the speaker. So, we try to relocate the speakers a bit closer to the listening position, making the distance to the front wall larger. The larger distance between the speakers and the front wall also usually improves imaging and perceived clarity in the midrange. The speakers are also raised around 10cm to bring the tweeter on-axis. Angling is adjusted so that on-axis points exactly towards the listening position. The response now looks much better in the midrange, and the tilt is reduced. The impulse response is surprisingly good, especially considering the type of speaker and no acoustic treatment in the room. 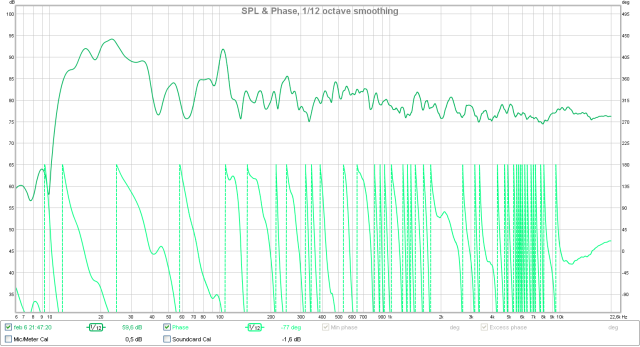 The step-response can be used to see if the subs are properly time aligned with the mains. Well, they are not, but that is not possible to correct when we have no delay adjustment on the mains. 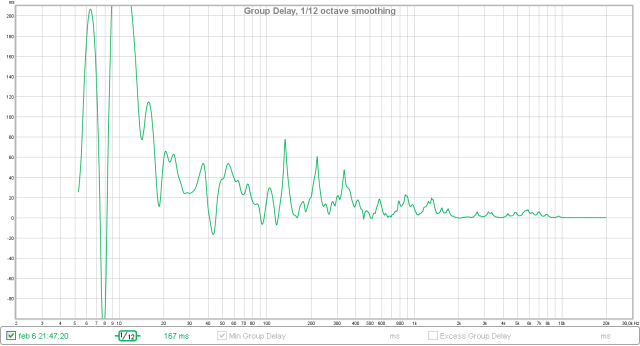 The group delay also provides useful information about timing issues. If subs and mains are properly aligned they will end up in-line with the same average group delay in the area around the crossover. This can be difficult to see because this frequency range is usually affected by room and boundary reflections causing large group delay deviations. We check the output and distortion of the subwoofers to see if it is likely that they can match the main speakers. Indeed, the small Compact Horn subwoofers easily outperform the mains with 110dB at 20Hz with 1.7% distortion. They can obviously do a lot more, I did not bother to check, as that requires recalibration of the mic amplifier for more headroom. The subwoofers seem well integrated, providing full-size bass with a heavy bottom, both impact and weight, dry and powerful. It does not get boomy or muddy in the bass even when the bass is running a little hot. The relocation of the mains further away from the front wall improved perception of depth and clarity in the lower midrange. The biggest problem is limited output capacity, it simply can not play loud. The bass range is not as smooth as one can experience from the best systems, and we know from the measurements that the response is not entirely flat. 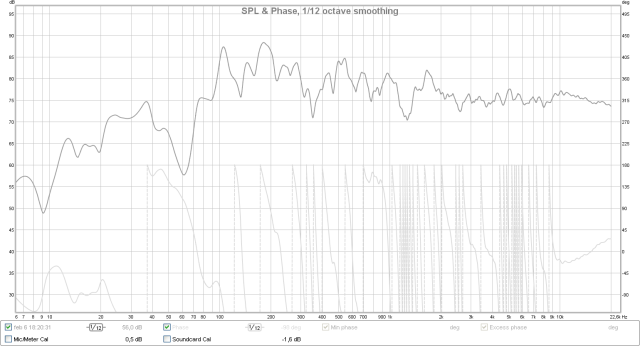 The bass is quite heavy at the lowest frequencies, level is low around 50-70Hz, and there is a peak at 100Hz. 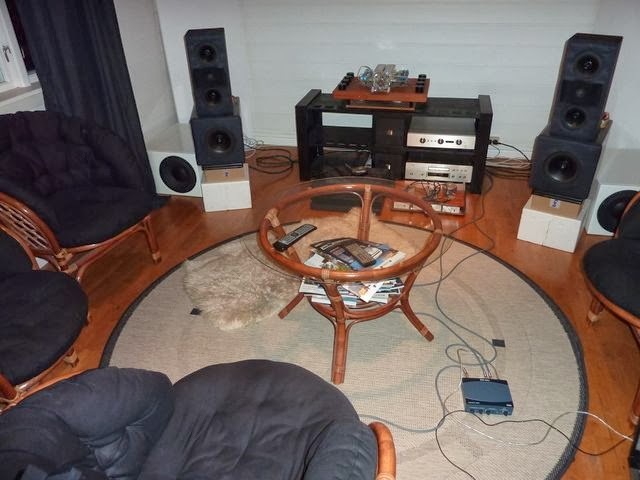 This can possibly be improved by moving one or both subwoofers, and adjust subwoofer level and crossover. Since this set-up was done primarily for this article, I am satisified for now. If anyone in the neighbourhood wants to hear and experience this system please feel free to contact me. If you are interested in reading more on audio systems and set-up, check out my article How to Set-up a Home Theater System.